I've been enjoying Kate Messner's novels recently. Her first book that I read was Capture the Flag and it was not really for me. But then I loved Eye of the Storm and Wake Up Missing, so I was eager to check out All the Answers. Unfortunately, I think it will get grouped with Capture the Flag. The idea is great, but the execution was too drawn out for me. 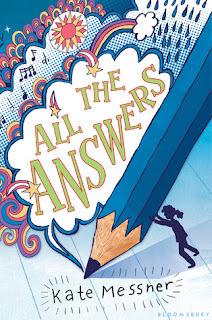 Ava has always been a worrier, so when she discovers a pencil that answers the questions she has written, she might be able to take control of her life. For awhile, it works, until Ava gets answers that she really doesn't want, and doesn't know how to cope. It was all a bit too much for me. Ava's father is constantly trying to find a gimmick to save his general store, her sister wants to be called by strange nicknames because too many kids in her class share her name, her best friend Sophie is fairly obnoxious and doesn't seem like she will stay her friend for much longer. It took me a long time to slog through something that should have been fun and exciting. I'm not giving up on Kate Messner, but I definitely plan on sticking to her science fiction books.